Interior designer Kristin Drohan may have been a new addition to the list of showrooms at the Spring 2015 High Point Market, but she is no newbie to the design industry! 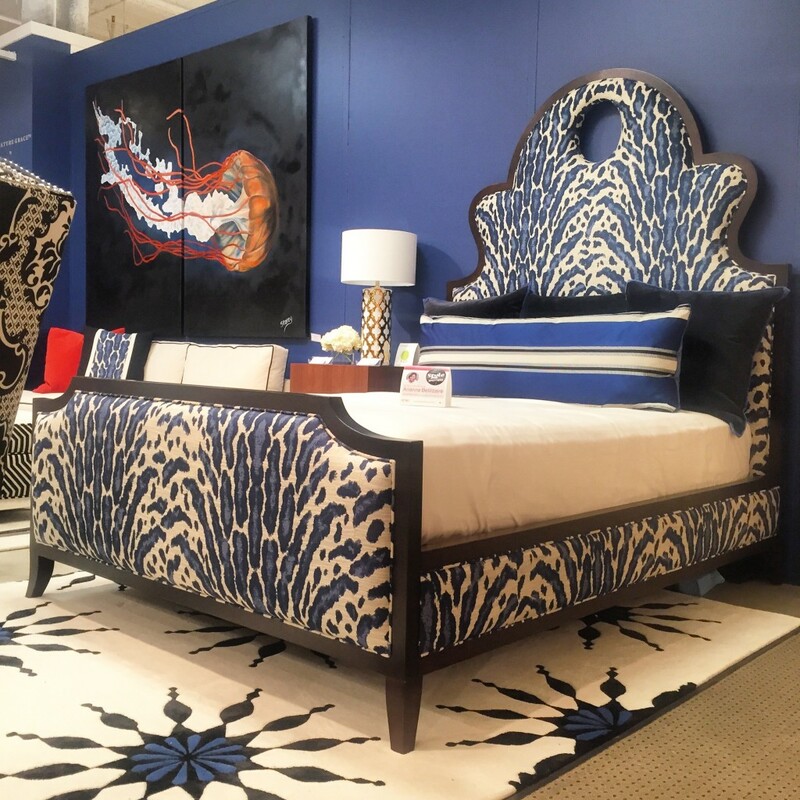 Kristin’s bold design aesthetic combined with her emphasis on using sustainable materials made her showroom a must-see destination at Market.Here’s a quick video of Kristin describing how she designed the uber-popular Denise bed. Kristin Drohan’s work has appeared in print and on-line publications nationwide. Her furniture line, which features a collection of durable, eco-friendly pieces including sofas, sectionals, beds, tables and chairs, is featured in high-end showrooms across the country. The furniture is manufactured in Hickory, North Carolina using natural, toxic-free materials. In fact, she is one of the first 100 interior design professionals to be certified by the Sustainable Furnishing Council, a coalition of suppliers, manufacturers, retailers and others dedicated to promoting eco-friendly furnishings. 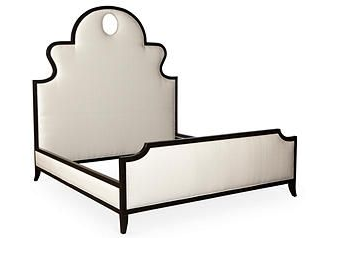 Kristin designed the Denise bed for a client who wanted a French feel with a touch of drama. Sure to be the focal point of any room, this luxurious bed features a seven-foot high headboard and an exposed frame in a dark walnut finish. 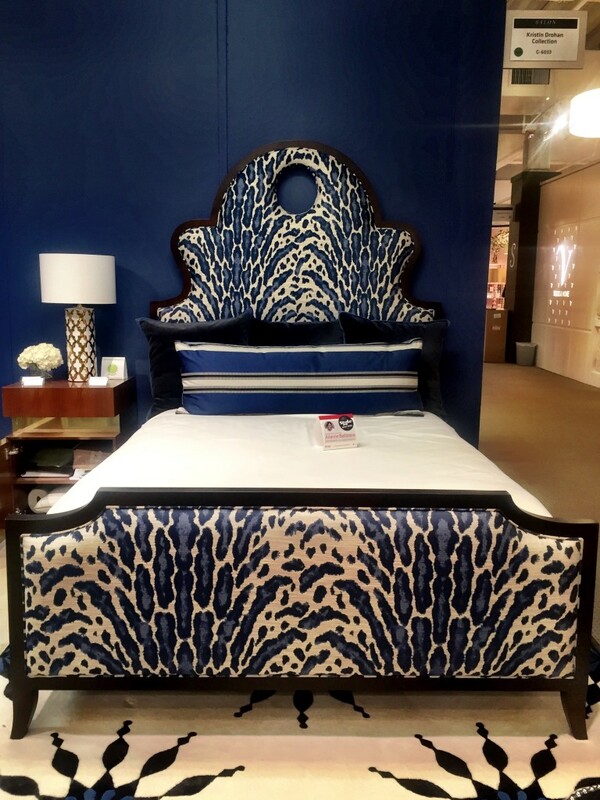 For her showroom at Market, Kristin covered it in this bold, blue printed fabric that would compliment the Farrow and Ball Cobalt wall color. Because each piece is customizable, the finish and upholstery material can be changed to your liking. A few of the buzz-words this Market were MADE IN AMERICA, HIGHLY CUSTOMIZABLE, and SUSTAINABLE. The Kristin Drohan Collections (and the Denise Bed in particular) fits all three of these categories. Her furniture is not only glamorous, but it is infused with Kristin’s desire to create beautiful pieces that are also environmentally responsible. Kristin has set out to design a collection of products to fill a niche missing from the current market. Her contemporary style also meets the performance needs of sophisticated, active families. I’d say she is a welcome addition to Market and valuable resource to designers everywhere!